You do not have to be shy and hide it. It is okay to admit it. We are talking about a thought that probably has struck any person’s mind, no matter whether it is because of movies, novels, anime or any other kind media. Heck, it does not even have to be media; it could just be your own imagination or our own history! The thought I am talking about is naturally, as this post’s title already has given away, in what kind of imaginary world you would live in if possible. And if we are all honest, who has not daydreamed around this seemingly silly thought? Why not experience how life in Hogwarts would be or meet up and become best friends with Sherlock Holmes (who would probably drive you insane)? When it comes to media, we sometimes become so absorbed into the story, what we wish we could take place in it, either by becoming the main characters ourselves or only being sidekicks. Other times, we become so fond of the world itself, that we just wished we lived in it instead of our own. But why do we dream of this? Why do we think it would be more fun to pew lasers in Star Wars than continue as we live now? This is mere speculation on my part, so do not take anything I say as absolute truth, but the reason might be idealization and a lack of explanatory depth of the stories. My idea is fairly uncomplicated, if you think about it for a moment. First of all, do we even know anything about the world in, say, Star Wars outside of the creators’ minds? We do not! Our own imagination is depending on how the creator has portrayed the world in that particular work. Even if Star Wars is all tragic and full of conflict, there is bound to be places full of happiness too, correct? But! Because of how the story is told, we do not even have the ability to grasp the world in the slightest. It lacks true depth. Economy, countries, politics, religion, classes and so on… we have no clue of how the world functions at all. Our idea of the world depends on what part of it we have been exposed to. K-ON! may be the most moe of all moe anime, but who says there are not crazy people running around in the town our four girls are sipping tea in? And perhaps the characters are not always that moe, but sometimes angry? With no exposition, we can only judge by what we do know and what we have experienced. You could call it an idealization, as the characters’ reality only centers around one little part of a massive world, the part only we, the viewers, know about. Because we are not shown everything, we end up loving what we actually do see. But, at the same time, is that not enough? It is the world we do see that we wish to live in. The happiness in K-ON!, the cool card games in Yu-Gi-Oh! and so on. That is what we want. We strive after what our own world cannot give us, we strive after something we find to be better. And this reflects how wonderful media can be. It truly is something out of this world, cooking up the most amazing ideas and bringing them to life. Sometimes things are even brought to our own reality, as seen with Star Trek. In a way, the border between reality and imaginary worlds is not that big and it is only a matter of time until it is broken. But before I completely go off the track here, I am going to finish this post. 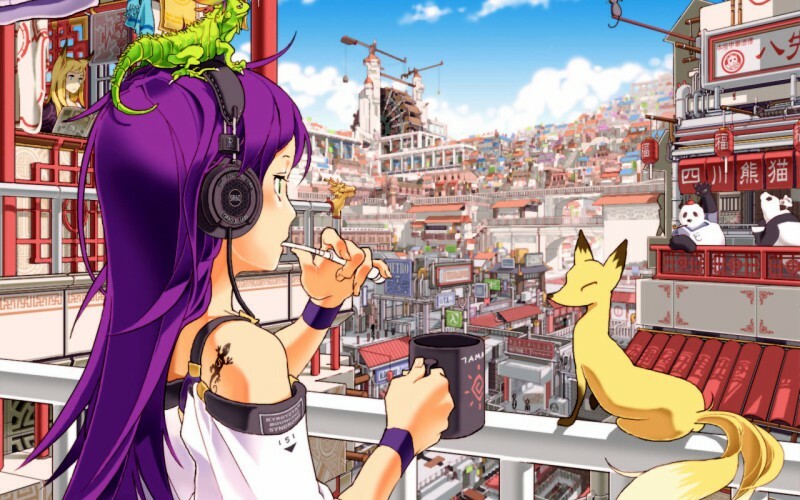 In a couple of days there will be a “Part 2” in which I will post a list of places in anime I would like to live in. In the meantime, why not post your own? This entry was posted in Anime, Editorials and tagged Adventure, Anime, Daydream, Imagination, Speculation, World. Railgun/Index’s Academy City sounds quite swell, but only under the circumstances that I met the minimum requirements to attend the same school as the main characters. Also, Dennou Coil sounds awfully interesting… can you interract with the things you see through the glasses? I agree that Aria has a world you would want to live in… so harmonic. My answer to this question is always the world in Aria. The most peaceful, relaxing anime world ever! Even if I weren’t an undine, it’d be wonderful just to live in such a beautiful place, with such friendly people. I wonder if undine is restricted to females only. Would be cool to see male ones too! The most common setting I have seen is school. Therefore, it is basically the real world. Even Haruhi Suzumiya with all those crazy instances are completely normal for the average person. So with choosing a world, unless you want exactly the same world with some of your favourite characters, you’ll need to specifically choose something with a special world. Pokémon and Digimon are the obvious choice for me. A pet and a dangerous world seemed so exciting. I believe it would be just as fun with an ordinary world, if it only means that we live together with certain characters. If we live in Haruhi’s world, we could join S.O.S! Pokemon because the chances of dying is low and the fun factor is obvious. It’s not like you have to go to school apparenlty either. Other than that anything with powers, though I would hope I got something good so I wouldn’t get picked off immediately by like a sneeze. Yeah, Pokemon would definitely be fun (I wonder how they survive in the world that young). What team would you have? First, I gotta agree with ML about how we see the anime only through the eyes of the protagonists. So the world we imagine ourselves to be in also has to be considered as whether we’re placed in the shoes of the protagonist. If we’re only going to be a side character, the world wouldn’t be all that different, since it’d just be school…in Japan. Generally speaking the various areas of Japan that you can and do see in anime have always looked great. Of course my current goal is to be living in Japan within the next couple of years anyway, so I guess that dream will happen. Well, every world has its ups and downs, huh? If the ups seem to outweigh the downs, chances are you’ll find the world appealing! Hmm, I’m struggling to think of a world I’d like to inhabit, maybe the world of Eureka 7? But, only ’cause I’d love to go sky surfing. That’s another way of thinking. This world got its own fair share of amazing places to visit, too. If I had the chance, I would be curious to live in the Cowboy Bebop universe. The chance of meeting those characters would be exciting. Also I would hopefully be able to get my hands on some of that awesome future tech. I envy that awesome chess board. Another fictional world I would be interested in visiting is the world of Sherlock Holmes and Arsene Lupin(the first). It has been a dream of mine to meet and interact with these characters. I wonder what insane adventures we would partake on together. Well I can’t wait to see the fictional worlds in which you’d like to reside. Bye-nee! Living in Bebop would be funky. Seems a bit rough though. What was so great about the chess board? I don’t remember it that well. The insane adventures of being part detective, part thief! You’re probably right that it would rough to live inside the Bebop universe. Those characters were just so interesting that I’d loved to meet them whether or not it was dangerous. Easiest way to meet them: become a criminal. Ohohoho. A little while ago I saw a post saying the last series I watch is my new home, and asking what that would mean. That series was Kimi to Boku, and while it may not sound different than normal, I must admit I wouldn’t mind being surrounded by people like that. I think my preference would be the world of Durarara, because it’s just crazy enough to always be fun and you’re less likely to die than in Baccano. Anywhere where I could do magic. Or travel faster than the speed of light. But I’d prefer magic. Hmm, Durarara’s style of Ikebukuro should be an awesome place, or maybe the BakaTest school..though I’d have to get crazy good grades. I don’t mind which world as long as there are cute characters. Though considering most anime, I’d get what I want. 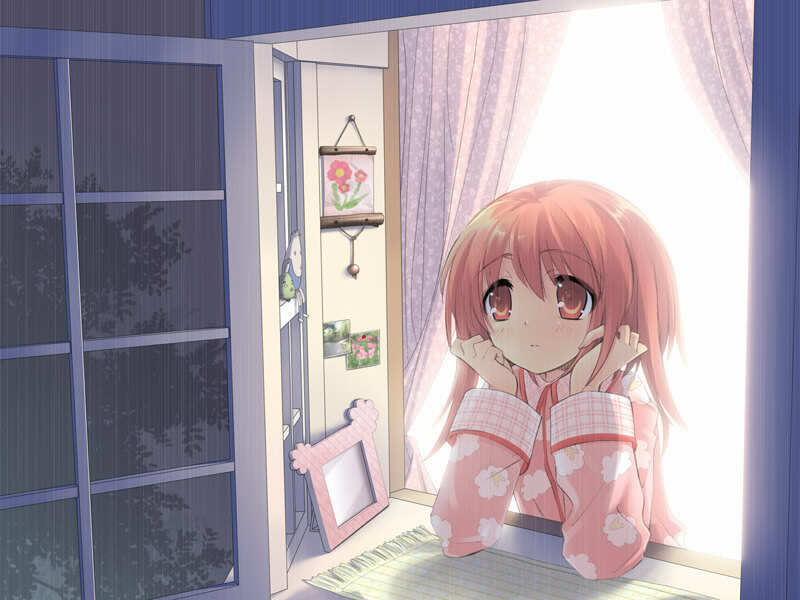 I’ll choose to become anime style and watch “real life” through the TV wishing I could go there. Even if it was real life, humans can be cute too.